Review Components Retail: Au24 interconnect $502/1meter pr. ; Au24 speaker cable $1,313/3 meter pr. Several years of calm coaxing by John McDonald of Audience ultimately led to my request for a full set of the Au24 High Resolution Audio wires. In the interim, a lot of ink and bandwidth -- by a literal Who's Who of reviewers -- had been enthusiastically devoted to describing the unique construction, musical character and honest value of these now venerable cables and interconnects. I'm not gonna drag you through another version of the equivalent factoids. I will say that I liked them better than the thrice-the-price Cardas Neutral Reference cables which, courtesy of fellow lunar-tic Jeff Day, spent some time in my system. I will say that I decided to purchase the Audience review pieces to use as my reference. And while I will also say a bit more as this article develops, that's essentially the long and the short of it with just one caveat: As Cool Julesman would be the first to remind us, "No cable is perfect and no cable is for every situation." Still, I will add at this point that during a recent BYOA bring-your-own-amp party hosted by Pete Riggle of Pete Riggle Audio (soon to be famous for his VTAF device aka VTA Adjustment on the Fly for Rega Tone Arms) and master-furniture- craftsman-turned-speaker-builder Terry Cain, there was no lack of oohs and -- even more so -- ahs when the Audience cables were placed into the system of the day. Amateurs and pros alike were quick to comment on the refinement, ease and musical completeness that the Audience offerings, quite literally, brought to this party. I like deadlines - especially the whooshing sound they make when they go by. During my review period with the Au24, I was distracted by another recreational pursuit in my life. These two ostensibly discrete processes and definitive revelations truly had a lot in common. I'll do my best to be succinct since the digression -- only at first glance, mind you -- may seem way off-topic. 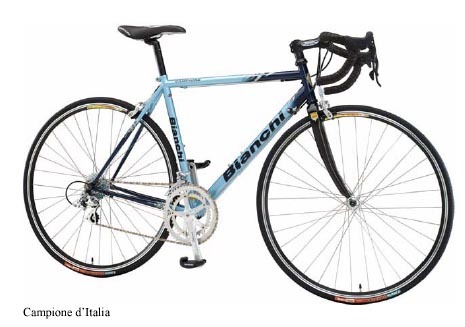 I've been cycling seriously for almost ten years. Over the last year or so, I've become increasingly less engaged in road-biking. The evidence: A decline from 5,000 miles/year to a paltry 2,000 in the last 12 months. The witness: My generally supportive bride noticing the rides getting progressively shorter, with me getting home earlier but, even so, not handling any more chores around the homestead. The reality: My aching neck and numb hands. To be fair, I don't suffer the other, shall we say, maladies -- they don't call those diamond frame bikes wedgie rides for nothing [you're sure that shouldn't be veggie ? - Ed] -- that befall my numerous long-distance-riding brethren. Sure, things can get a bit sore but thankfully, my real concerns live higher up on the anatomy. a bit more disturbing -- that if you want to ride, you'd better hit the road for a few months. First, the inevitable dirt-turning-to-flour syndrome makes peddling through much of the course a lot more work than fun. Second, the rattle snakes peek their heads out from rock crevices, with many at impressive eye-level on some of the ravines we frequent. Experience is that marvelous thing which enables you to recognize a mistake when you make it again. The idea of quitting the road race was not one I wanted to entertain. But really, it appeared to be time to give it up. The neck ache was interfering with my sleep, my riding buddies were pretending to feel no pain and I was tired of making ever-more-frequent co-payments to see the quak-chipractor for therapy. I told him as much during my last visit. He told me to "get bent." So I did - get bent. Recumbent that is. No, the good doctor suggested, I shouldn't just lay down and give up. I'd spent years training and might rather try something out of the ordinary. So I got a bike that I could lay back upon. In fact, I got one from Bacchetta (stick in Italian), a company formed in 2001 by a couple of BVs - bent vets. With over 30 years of combined experience in the design and manufacturing of some of the world's most famous recumbents, this company, just two years later, won the recumbent-of-the-year award. The Strada I picked out (street in Italian) is a straight-forward design that fits in well with the wedgie crowd but offers all the comfort and aerodynamic advantages of a recumbent. It's also a serious open-road, high-rolling Tarmac-devouring machine - Shimano 105/Ultegra, with 26" rims on each end, seat height of 24" and a bottom bracket that's centered 32" off the ground. In short, it's a stick to beat the street with and some riders I could never keep up with before. The Strada is lean and nimble, handles the high-frequency climbs without taxing me into oxygen debt and cruises like a dream once you get the hang of it. The hardest part of the switch from the DF diamond frame (or wedgie if you prefer) was learning to relax. It just didn't seem right to be so comfortable and undistracted by the physical irritations that I had historically found in my way! After all, while most of us learn to ride a bike when young and probably haven't forgotten the basics, getting bent (which ironically enough means getting un-bent when compared to the traditional position one assumes on a DF) takes some getting used to. 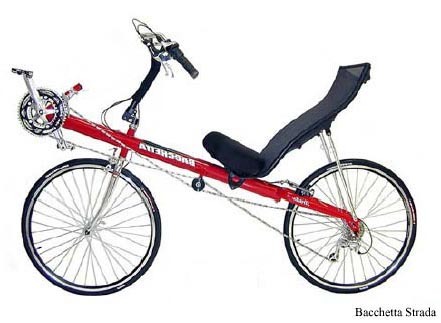 Even so, recumbents are clearly God's apology for diamond frames. Thank you. the Au24s [and Paul the Maestros - Ed.]. What did I think of them? The best (and hardest) part of reviewing this product was that the cabling in front of me did not draw attention to itself. By virtue of size, pedigree or ability to highlight and exaggerate various sonic details, it could have like so many others. Instead, it only drew attention to the musical message by getting out of the way. That's a pretty rare accomplishment in a field littered with products that sound great. Webster's "Born on the 24th of July" where the natural soaring of the female vocals is countered by the grounding of percussion that is deep, taut and alluring: Everything has found its proper place on the horizon. Some people make fun of recumbent bikes, calling them nerdy among other things. Even as a relative newbie, I just grin as I pass those folks in the hills and think to myself, "they're just jealous because the voices are talking to me now." Rhetorical question alert - have you noticed how over the years, many cables have gotten very large and often unwieldy? The related hype has led many consumers to shift gears into a bigger/fatter = better mentality. Skinny wires are therewith looked upon as somehow inadequate, especially as a means for bass delivery. Well, just as a week on my stick transformed my cycling experience, a week with the Audience products will change your mind about that. If it's nerdy to give up the pain of wrestling with the road or huge, stiff cables while improving performance, sign me up. I'll just keep grinning. The Au24 Loudspeaker Cable is only 4mm or 1/8" in diameter. And, Audience is not the only company to make skinny snakes. The 47Labs OTA's single-strand 0.4mm OFC wire in plastic tubing is one example of how downsizing can be taken to some pretty interesting limits. [Ditto for the entire range of Dutch Crystal Cables - Ed.]. Bents have been around since the late 1800s (historical photos herein courtesy of Bikefix). The real story starts -- and stops abruptly just eight months later -- in July of 1933 when a second-rate racer named Francois Faure sets a new world record for distance traveled in an hour. On a recumbent, he does 45.056 kilometers, thus travelling at just a hair shy of 28 mph!. That annoyed a few folks like the United Cyclists Internationale (UCI). 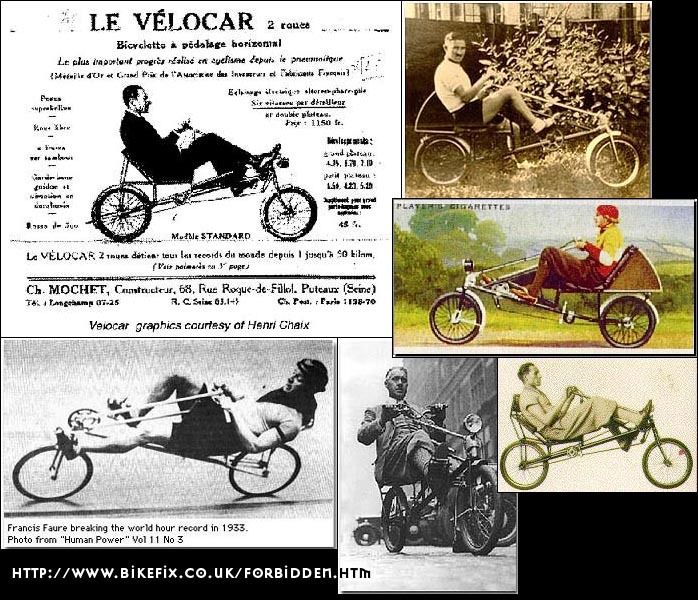 Shortly thereafter -- and to be generous with the verb here -- the UCI created some new rules to indicate that a recumbent wasn't a bicycle at all but rather something completely different and unrelated. Let's see now - two wheels, peddles, a chain, handlebars, a seat and human propulsion... clearly no relations whatsoever. The ruling took effect on April 1, 1934. Fast-forward to 1979. After Gardner Martin produced the first Easy Racer® recumbent, the Dupont chemical company offered $15,000 to the first human-powered single-rider machine that could exceed 65 miles per hour. And there you have it: The revival of the recumbent was upon us. Because they are 25 to 33% more aerodynamically efficient than a conventional upright bicycle, recumbents once again won the race. Their unique design also taught people that long-distance cycling needn't be painful. In fact, my bent is quite comfortable and offers a much better view of the passing scenery. But wait, there's more - you also get torso toning and strengthening that's not possible on a wedgie. And that means I no longer have to abdicate hope of ever having a flat stomach. Ease of experience. Alacrity. Tonal correctness. Works for me.